Some of the children that she used to bring in used to come to me and say “there’s someone you will enjoy seeing when she comes in with the class so you have a good look and see if you like her” and I believe they said the same to Jill as well. And sure enough this lady came in one day, it was raining actually, with all these children to come swimming, umbrella up in the air and yeh, very appealing so we eventually had a chat and eventually I asked her out, and following on from that we got married a year later. Sometimes the water was not warm and after five minutes swim we had to come out and some of them were a bit blue…we knew it as Grange baths, not the Lido. 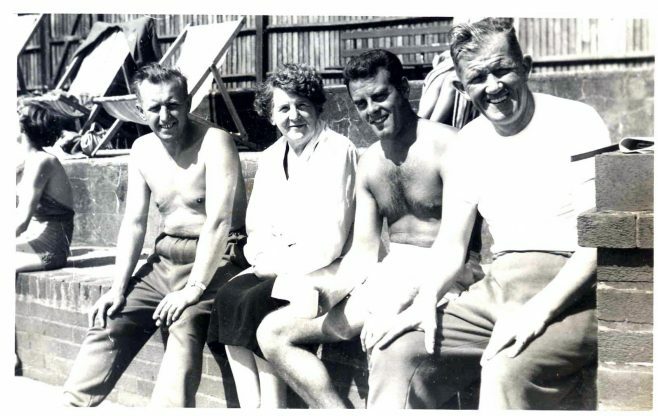 Jill spent much of her teenage years at the baths with her friends and Eric remembers the hot summer of 1947 and the pool bursting with swimmers. The paddling pool was nicknamed the piddling pool by the locals.